It’s a magical moment when you find yourself fighting the urge to vomit and fall to your knees as bats in the moonlight beat the air next to your face. 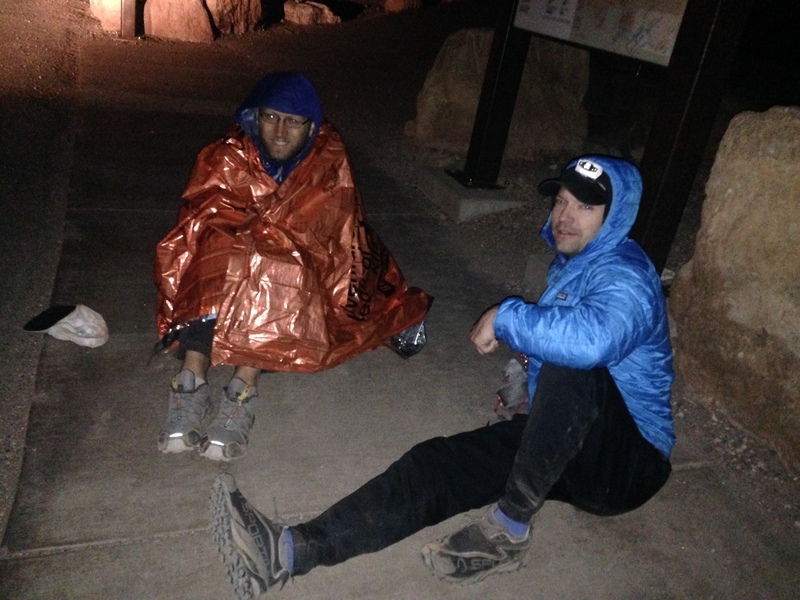 The South Kaibab trail is relentless at hour 14. Two miles to go, I was “running” a 60 minute mile. I looked down the moonlit canyon and could easily make out switchbacks lying in a pile at my feet. The bright half moon allowed me to ascend without a headlamp. It’s just as well; I needed the view. 14 hours ago I did use the headlamp as I jogged down the trail with two friends. They had never met, and I hadn’t seen the one in over 10 years. We high-stepped over water-bars, logs, and rocks, chatted about old times, got to know each other and let ourselves get carried away with optimism. One member of the party even announced that he was sure to make it back before sundown. The previous evening at the trailhead, an experienced runner gave me some advice: “It’s not a race to the North Rim. You have to make it back across the river. From there, you can crawl out.” Though I thought about it, I didn’t try crawling. I doubt it would have been much easier. The strongest runner had the first wildlife encounter. He had pulled well ahead and met a bighorn sheep on the trail. The sheep eyed him for a moment then advanced and squeezed by. Less than an hour later, we passed four deer grazing only feet from the trail across the creek from the Bright Angel campground. Only one of us noticed. We stopped at Phantom Ranch to refill water. My friend bragged and entertained the campers who stood outside the cantina warming their hands around their morning coffee. Reactions to our endeavor varied from the incredulous to the dismissive. After Phantom Ranch the trail climbs slowly through a box canyon of nearly 2 billion year old schist and granite to more open areas near Cottonwood campground and Ribbon Falls. I would like to have seen the falls but I didn’t feel a detour would be wise. At Pump House we found a chalkboard with a mysterious message. “Gerd #74 03/08/14”. We pondered it’s meaning, added our own names and refilled our water. 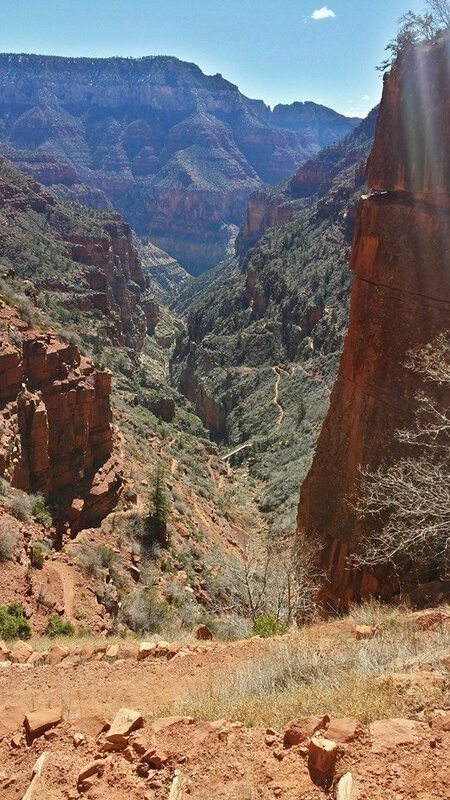 I decided to walk the remaining 5.5 miles to the North Rim. My friends pulled well ahead and I didn’t see them again until about three miles later when I heard a booming laugh. This was Gerd’s way of introducing himself. Gerd was coming down the second leg of his 74th crossing. He must have seen many like us in so many crossings, yet he was keen to talk. He joked, gave words of encouragement, laughed and continued down the trail. The next human I saw was a man on a mission. He loped past and grunted his greeting. I could practically see his earbuds pulsing. Shortly after, the leader of our group came running by. He was about 10 minutes ahead of me. We had been advised to carry microspikes in case of ice on the trail. I had forgotten mine but it turned out not to be an issue. There was some snow on the trail, but it wasn’t hazardous. The second member of my party was waiting for me at the north rim with Brian, an Arizona Trail hiker. Brian was looking at the last 80 miles of an 800 mile hike. He seemed envious of our food. The north rim is cold in March. We didn’t linger. As I ran back into the Canyon I began to feel the effects of the distance. I gave up running just after Cottonwood campground and walked into Phantom Ranch. I was happy to find my friends waiting for me. We were all going to come out of the Canyon well after dark. I had read somewhere not to worry, that the canyon is magical after dark. Whoever wrote that was right. We finished our adventure after 16 hours, 42 miles and 11,00 feet of climbing. The Grand Canyon is a special place. If you are a long distance runner you owe it to yourself to go there. You don’t have to run across and back in one day, but you should at least put your hands and feet in the dirt. Do it for whatever reason drives you. Do it for that magical moment when you don’t give up. Justin and Jeff after completing the Rim2Rim2Rim. This entry was posted in Uncategorized and tagged Grand Canyon, Justin Barker. Bookmark the permalink.